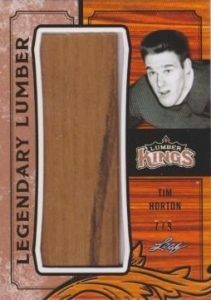 2016 Leaf Lumber Kings Hockey offers, as the name suggests, hockey stick memorabilia cards. The debut product covers nearly a century of iconic hockey players in the same vein as ITG Stickwork. Each box contains four hockey stick relics. 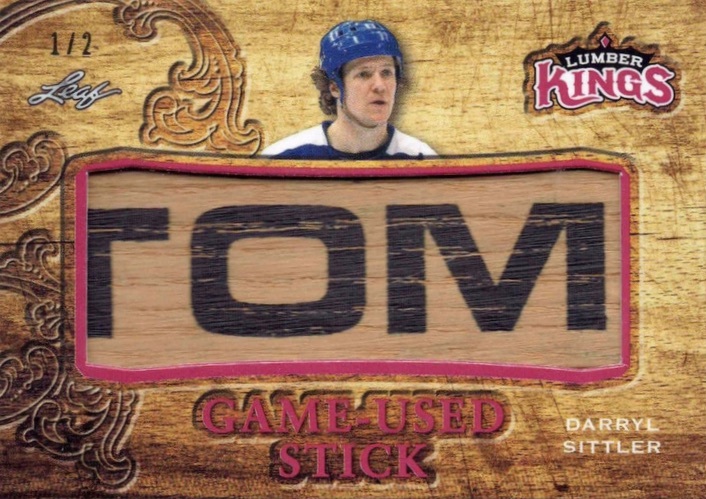 A hit only release, 2016 Leaf Lumber Kings Hockey has something for nearly every hockey fan. 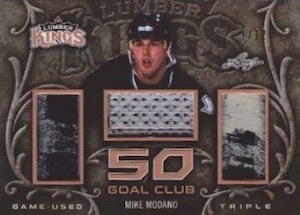 The triple-relic 50 Goal Club set highlights players who scored at least 50 goals in a single season while the eight-player 500 Goal Club relic is reserved for legends with career scoring of 500 or more goals. 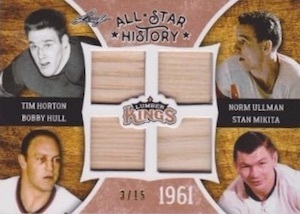 All-Star History quad player relic cards represent the top athletes of the game beginning with the 1947 All-Star Game. Honoring the greatest franchises, All-Time Lumber Team 8s offers an eight-piece stick card featuring the key players from each team. 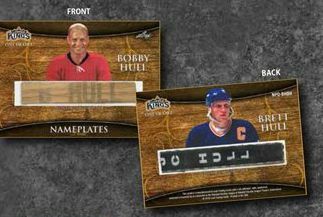 Nameplates and Dual Nameplates inserts give collectors the opportunity to own a piece of their favorite players' stick notation, including Bobby Orr, Wayne Gretzky, and Gordie Howe as a single relics, along with Brett and Bobby Hull for dual relic cards. Allowing hockey fans to collect a relic dream team, in an eight-piece stick card, of course, is the Fantasy Stick Rack set. 2016 Leaf Lumber Kings Hockey also has two main options for game-used stick relics: Game-Used Goalie Stick and Game-Used Stick. Each contains a large piece of memorabilia from hockey heroes like Johnny Bower, Pavel Bure, Ken Dryden, Guy Lafleur, and Mario Lemieux. Legendary Lines pays homage to the most memorable lines on ice with a triple relic. Preserving memorabilia from the superstars of yesteryear, Legendary Lumber includes a large stick relic for players such as Jean Beliveau, Maurice Richard, Eddie Shore, and Gaye Stewart. 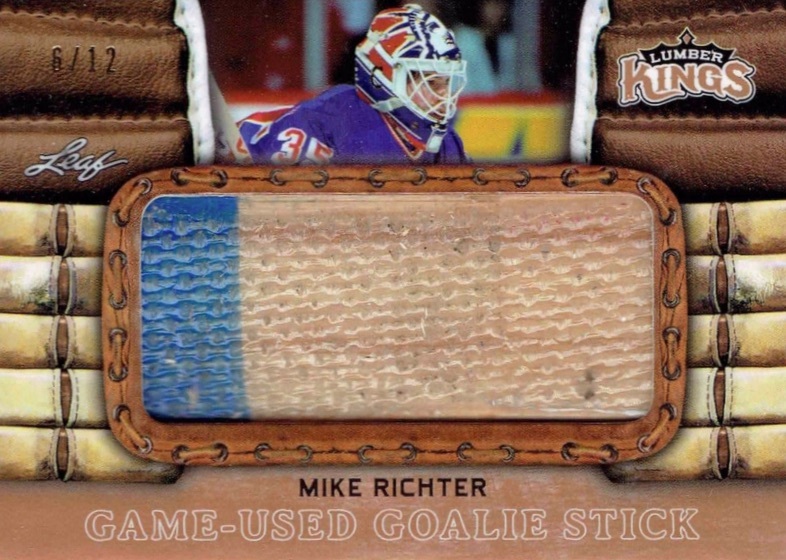 In addition, Original Sticks features relics from stars who played for one of the original franchises, while Original Sticks Six focuses on the first six franchises with a six-player relic format. 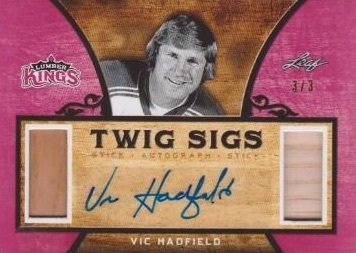 Lastly, Twig Sigs is the only autograph set offered in 2016 Leaf Lumber Kings Hockey and it combines stick relic pieces with an all-time great's signature. 2016-17 Leaf Lumber Kings Original Sticks Gold #OS11 Gordie Howe 1 1 Rare!!! 2016-17 Leaf Lumber Kings Goalie Sticks Gold #GS01 Andy Moog 1 1 RARE!!! All Emerald parallels are show-exclusives and not found in boxes. PARALLEL CARDS: Platinum #/5 or less, Red #/3 (*Card #MR2 - #/2), Emerald #/2, Gold 1/1, Printing Plates 1/1. 56 cards. Serial Numbered #/12. PARALLEL CARDS: Platinum #/5, Red #/3, Emerald #/2, Gold 1/1. PARALLEL CARDS: Platinum #/4, Red #/3, Emerald #/2, Gold 1/1. PARALLEL CARDS: Platinum #/4 (*Cards #07-09 - #/5), Red #/2, Emerald #/2, Gold 1/1. 14 cards. Serial Numbered #/10 or as noted. PARALLEL CARDS: Platinum #/5 or less, Red #/3 or #/2, Emerald #/2 or 1/1, Gold 1/1. 13 cards. Serial Numbered #/12. PARALLEL CARDS: Platinum #/4, Red #/2, Emerald #/2, Gold 1/1. 20 cards. Serial Numbered #/12 or as noted. PARALLEL CARDS: Platinum #/3, Red #/2, Emerald 1/1, Gold 1/1. 75 cards. Serial Numbered #/12 or as noted. PARALLEL CARDS: Platinum #/4 (*Cards #BG1, JB1 - #/3), Red #/2, Emerald 1/1, Gold 1/1. 26 cards. Serial Numbered #/9. PARALLEL CARDS: Platinum #/4, Red #/2, Emerald 1/1, Gold 1/1. 22 cards. Serial Numbered #/12. 4 cards. Serial Numbered #/15. 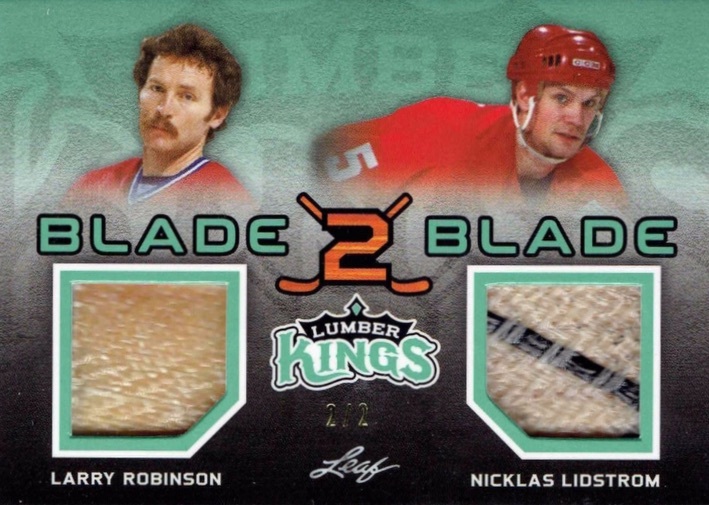 Shop for 2016 Leaf Lumber Kings Hockey boxes on eBay.